The Everest Seedless is a cold-tolerant, blue-colored Concord type with berries that weigh up to seven grams, roughly twice the size of the traditional Concord. 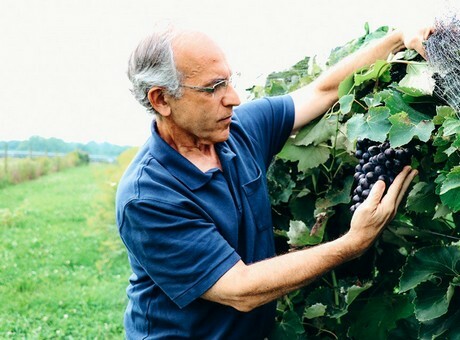 Because the grapes are relatively easy to grow and produce large, flavorful, seedless berries, Bruce Reisch, professor of horticulture in the College of Agriculture and Life Sciences, and grape breeder with Cornell AgriTech, predicts they will become popular with home gardeners as well as professional growers. Everest Seedless is being exclusively licensed in the US to Double A Vineyards of Fredonia, New York for 10 years. Vines can be purchased from them starting this fall. Last year, Reisch’s team solicited name suggestions for this variety and received nearly 1,600 submissions from around the world, but the team could not find a name that would work. They needed a name they could trademark, that was not already in use among vineyards or wineries, and that could help describe the fruit. This led to the name Everest Seedless, a nod to the celebrated Nepalese mountain. To breed a grape that’s seedless and nearly double the size of a Concord, Reisch used a unique genetic approach. Most cultivated grape varieties contain 38 chromosomes, but some contain 76 chromosomes. The larger number of chromosomes results in naturally larger berries, but breeders have to be careful to match their crosses with varieties with an equal chromosome number. According to news.cornell.edu, The grape that became Everest Seedless resulted from a cross made in 1998 and was first planted in 1999. It has since been field-tested at several locations.